Published 14th November 2018 at 228 × 400 in Dogs Looking for Homes. 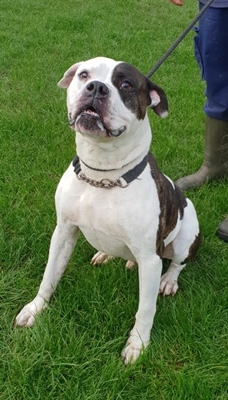 ‘Nasha’ 7 year old Male American Bulldog. Nasha was originally a stray so his habits and history are unknown, Nasha is a very big, strong and boisterous dog. He does need a bit of lead training as he tends to bite the lead. but does listen if you tell him not to so with time he should get out of this habit. He would suit a home with experienced owners of his breed who have a lot of time to help train him. Nasha loves playing with toys and does know some basic commands. Nasha cannot be rehomed with anyone under 14.